backed by the power of artificial intelligence. AppCard is an advanced customer retention system designed specifically to service the needs of mid-size retailers, franchises, and independent grocers who are ready to start capitalizing on the potential of their customer data and analytics. AppCard is more than a loyalty program. It’s a powerful multi-channel marketing platform that helps you consolidate your marketing efforts and communicate directly with your customers. With AppCard, your business can finally deliver the right message to the right customer at the right time. Send the right message, to the right customer, at the right time. Browse AppCard company news and new release information. Meet our team of data scientists, technology and marketing experts. See other retailers, grocers and brands who have already discovered the power of 1:1 marketing. Bring your creativity and expertise to a thriving workplace. Let us help you schedule a demo, register for service or build your next great campaign. Today, customers want to build a relationship with their favorite brands – and be appreciated for it. 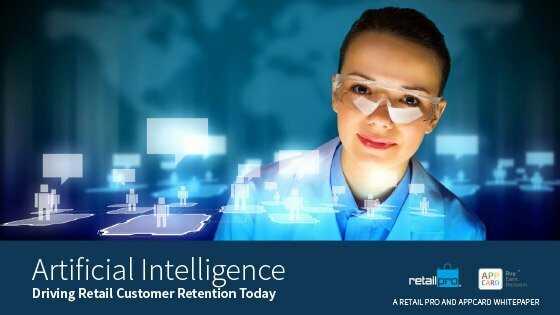 Download our white paper, “Effective Customer Retention Using Artificial Intelligence,” to learn how AI and machine learning is changing the game in customer retention.